Get Better Test Results In Half the Time! Study anywhere and pass your law school exam or the bar with our spaced repetition system. or your law school exams? How much material can your remember from your last study session? 10%? 25%? 60%? Remember 92% using our proven study technique! Our method - spaced repetition - is the single most effective technique for memorization. 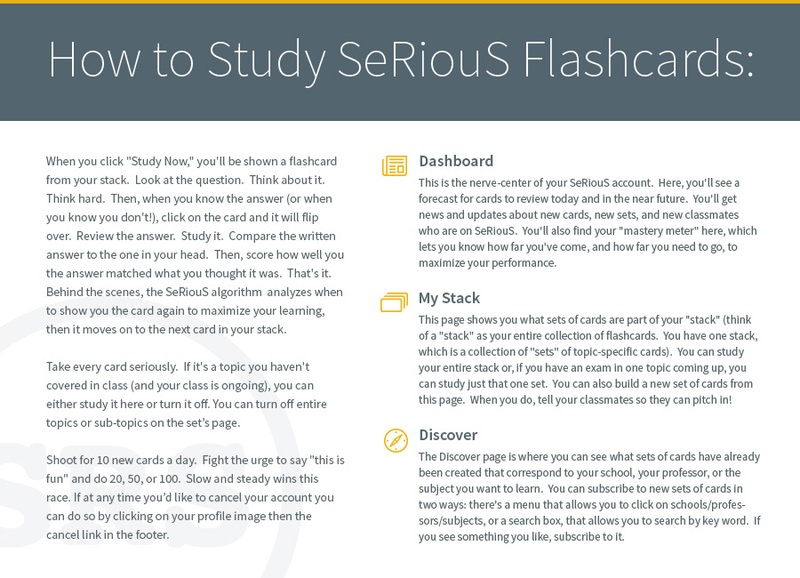 When studying flashcards with SeRiouS, you grade yourself on how well you knew the answer. Using this information, our algorithm schedules the next time for you to review. The effect is that users learn far more, in far less study time...and never have to cram again. Remember more in less time it's currently taking you to study. Use your own decks or use the Boost Deck created by law professors to teach the most tested 1L and MBE content. Use SeRiouS at home or at the bus stop -- all you need is internet! Get the latest SRS news and updates delivered right to your inbox! Our updates are sent sparingly and are never used by third parties.